Shirts With Random Triangles: Oregon's Jake Fisher mocks the SEC as being "super big and scary." 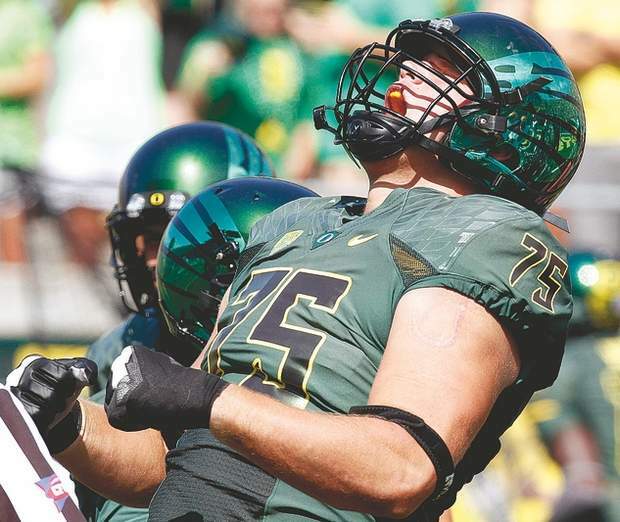 Oregon's Jake Fisher mocks the SEC as being "super big and scary." Oregon junior lineman Jake Fisher dipped into the sarcasm closet a little during an interview with CSN Northwest discussing the Ducks' upcoming game against Tennessee. Instead of going just snarky on the Vols' (which would have been easy, considering the past few seasons in Knoxville), he decided to take on the whole flipping conference. "They're big, strong and fast, and they're the SEC, and no one can beat the SEC, so, we're going to have all the challenges." "Yeah they're really big and scary, so, we're all really, really intimidated by the SEC, so we're just going to have to keep our minds right." "Yeah, it's our dream to play the SEC, so, you know, we're just going to come out and play a good game." Here's video of Fisher making his comments. Uh, Jake, which conference did Auburn, the team that beat Oregon for the 2010 BCS title come from? Exactly. Granted you weren't on that team, but don't think that facing a Tennessee team in the rebuilding stage is going to be a walk in the park. You are right about one thing. It was no walk in the park for Oregon, but rather a leisurely stroll with a lollypop in hand!